The history of King’s exists in more than just College lore. Welcome to the University Archives. 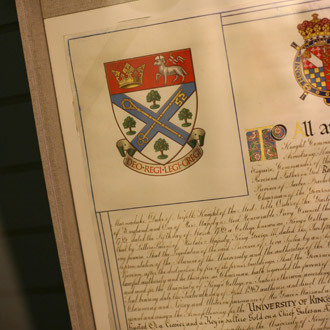 In addition to records created by the University’s administrative bodies, the Archives contains a variety of other holdings relating to the history of the University. These include a significant collection of photographs and several student publications, such as The Ancient Commoner (1965-1988); The Watch (the monthly student news magazine, published since 1989); Babel, published by the Early Modern Studies Society since 2002; and HINGE, a contemporary studies journal. Weldon Collection of Pottery and Porcelain guide. 36 pp. Halifax, NS. The Library, University of King’s College, 1993.